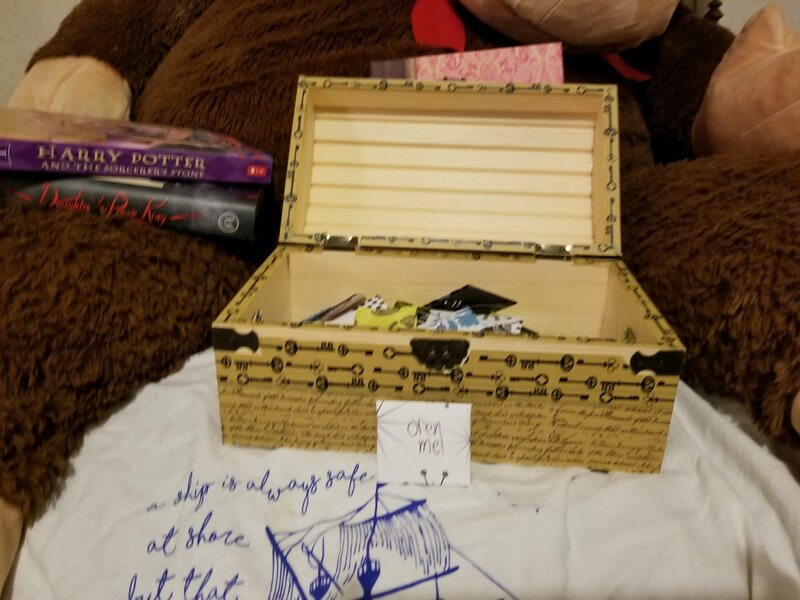 To Be Read Book Chest. So every Bibliophile ever has always had a hard time deciding which book is next, in a world that just simply has so many different great ones. Different Genres, different and amazing authors. Stories we wait forever to get, only to get busy and more come out. So my problem the past couple days as I get back into reading full-time is ‘What Do I Read Now?’ and it hit me… I still have a project that I was severely undecided about… My To Be Read Chest project. 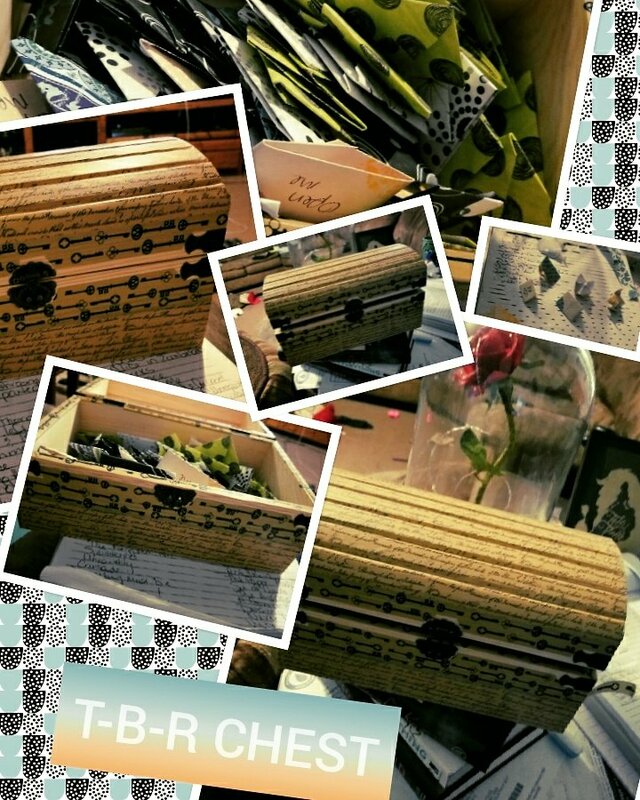 Since for the longest time I have seen people with TBR Jars..My thought was.. what if I did a chest.. like a pirate chest. 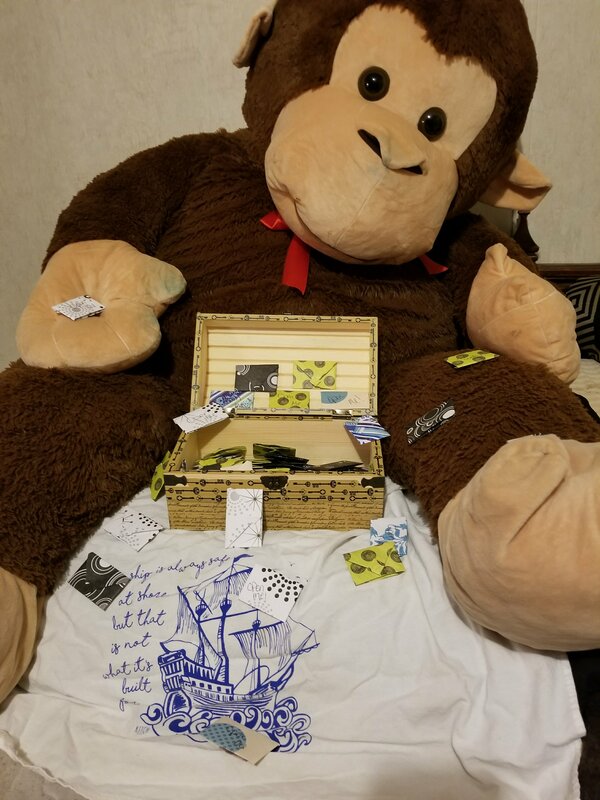 Luckily my uppercase subscription gave me that idea when they sent me a pirate themed box – one I have still yet to read. So going to the craft store I looked and found one… my full intentions was to paint it.. or stain it.. or no idea what I wanted to do. I just knew I wanted it, so I put it on my desk shelf and just let it sit… and sit… and sit there. So I gave up… I grabbed some washi tape I had lying around that had writing on it.. and went to mess with it.. only to figure out I hadn’t painted it.. so if I this looks crappy.. I was like who cares.. its MINE.. and its unique and its different. But the next problem came. How in the world was I going to do the paper in the chest.. I mean seriously.. Its a pirate chest! And I am not the greatest at origami… Looked up kid friendly origami.. and despite my best efforts I was only able to do the envelopes..But they reminded me of Harry Potter.. you know in the movies when the envelopes poured in the house? Yea.. My creativity knows no bounds or limits. And since I wanted them to scream at me to open them… I wrote.. “open me” but after thinking about it… it was really inspired by one of my favorite classics – Alice in Wonderland. After about what seems to be 900 tiny envelopes… which probably is only 100ish? Cause I got tired.. I finally have a chest I can be happy with. After letting my Money whom is named after Rhysand from ACOTAR series.. he is MY BOOK BOYFRIEND. -swoons- I gathered all my bookish stuff and let my now teenage daughter do his photo shoot. And pick the new book I will be reading next. Anything I have already read – Since I am writing reviews. Anything I have started… and then put down only to pick up another one. And now … the winner of tonight’s TBR draw to review next is.. 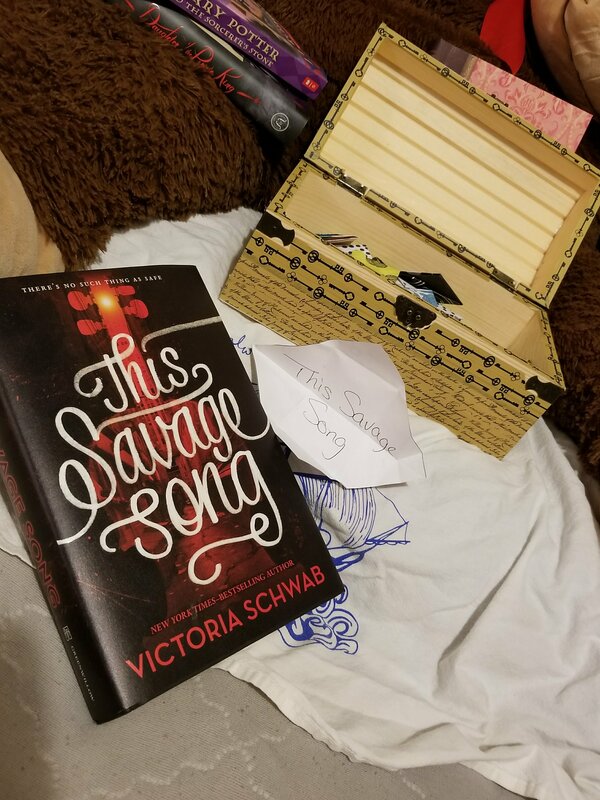 This Savage Song by Victoria Schwab. Happy reading, my fellow Bibliophile Addicts!! If you have any book suggestions make sure you comment them or find me on twitter!